Come winters and comes the early morning after bath ritual of my husband slapping a thin layer of Pond’s cold cream all over his face and hands. As he carries on with his daily practice of protecting his skin from harsh winters before stepping out of the house, the familiar fragrance of this moisturizing cold cream from Pond’s reminds me of the first beauty ritual I learned from my Grand ma. My Grand ma never had a facial and never used any fancy skincare and anti ageing products we use today but her skin looked flawless! Good food, pleasant environment, you would say. But more specifically, it was her diligent use of Pond’s cold cream before going to bed. Every night she would put on a thick layer of Pond’s cold cream and swipe it off revealing the most luminous skin underneath. Even today, Pond’s cold cream is one beauty product that we all use in some way or the other but never seem to take note of it. And you will be surprised to know, despite its eternal existence on my family’s dressing table, I had never used this cream before. It was only when my skin started turning extremely dry this Winters and my Olay natural white night cream failed to help, I turned to my hubby’s closet for this legendary cold cream from Pond’s. Before I go on to describe my personal experience with this historical beauty product, let me tell you this is one rare case of a beauty cream that does exactly what it says to do with minimum fuss and no mess! The product claims to moisturize rough and stretchy skin and protect it from harsh winters making skin look radiant and supple and it actually does exactly that. Although, the external packaging and physical appearance of Pond’s cold cream has changed greatly over the years, the original scent and texture still remains very much the same. Today, this product comes in a cute white colored rounded edged tub with a blue screw cap. The cream has the same soft and creamy consistency. Though I found the texture to be less greasy than its historical counterpart. It gives a very smooth and soothing feel to the skin immediately after applying. Skin looks instantly supple and radiant. What I still love the most about this cold cream is its heavenly soft fragrance! I am using it both as a night cream and make up remover. The only downside is it can make skin look gooey if you apply too much. 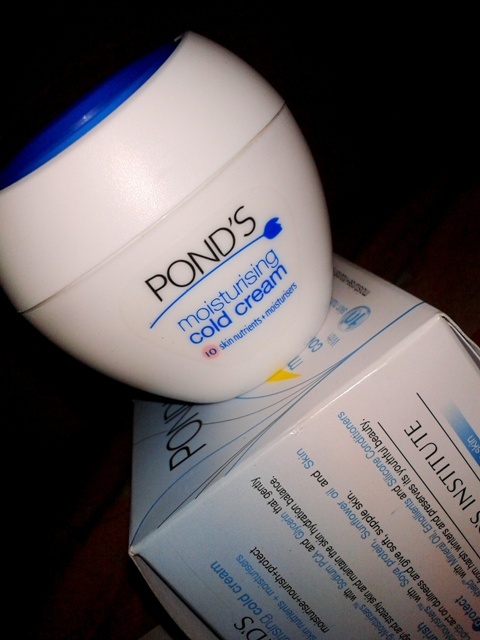 Overall, Pond’s moisturizing cold cream is a great product that has been there in the market for around ages. It is not a fancy product but fulfills all its claims. It is best for winter weather, when you want a deeply moisturizing product. The best part is it is economical and can be used for multiple purposes. Replace your face wash with cold cream as cleanser. Slather a thick layer and take it off with a cotton ball. Will I Repurchase: Yes, but only for winters. Thanks so much Holly for liking the post and finding it useful. Yes, I have used cold cream many times for my chapped lips, it does help. Thanks for the nice words. Will certainly check out the giveaway on your blog.